Intensifies life force energy in the Root Chakra and Kundalini line. Connects the Kundalini and Hara lines thereby connecting life force with life purpose at the physical level. Stimulates the will to live, alleviates physical coldness, weakness and fatigue. 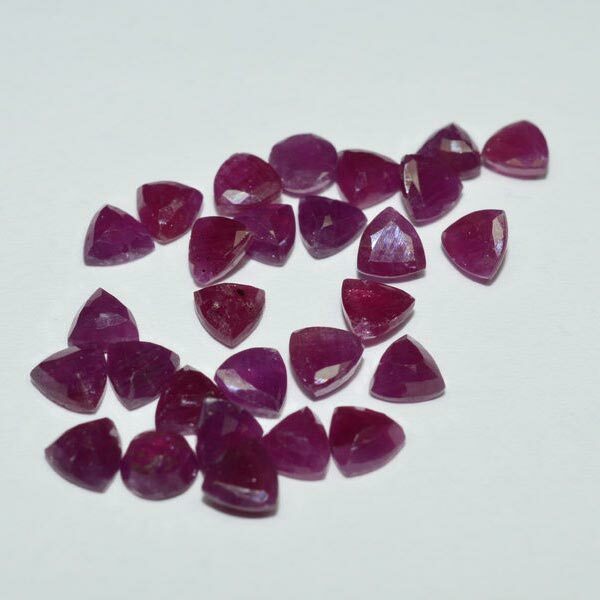 Ruby has a Trigonal Crystal System and is in the mineral class of Oxide, the Corundum Family. It is formed magmatically as a liquid that is aluminum rich or during the metamorphosis of granite into crystalline slate or marble. 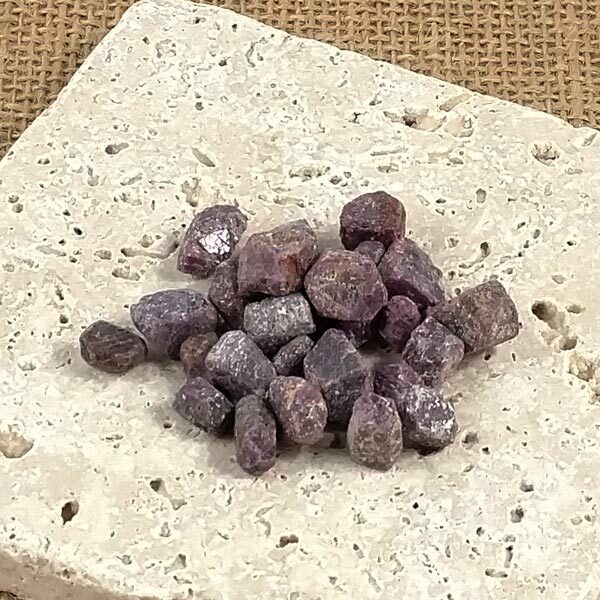 Being part of the Corundum Family, it obtains its red color through the presence of chromium. When rutile needles are embedded in the Ruby asterism (star formations) are easily viewed. The color of Ruby can include pink, crimson red, and orange red and occasionally a blue coloring. Found all over the world, some very nice specimens have been coming from India and Madagascar. Recently used as a conductor of sorts, it is said to provide a pathway to the earth and its user as an aid in understanding and actualization of how healing processes may be manifested. Ruby can be worn as a chain of beads, in a pendant, used as a hand comforter or laid upon the body, with the best results laid on the pubic bone. It is best to start with short periods of exposure time and see how you react to its energies. Ruby provides style and vitality to life, it bestows a passionate driving force but is able to prevent tendencies toward self-destruction. Its role for us is a life loving stone. Ruby provides a healthy tension and dynamic in that it enlivens, rejuvenates and fires our enthusiasm. It can bring us out of lethargy and exhaustion and seems to provide a balancing effect on hyperactivity. It also has been known to stimulate sexual activity. Used with care, it can also help resolve past anger issues by releasing the old anger. I say used with care because it is possible if you are not completely ready to let go of it there will be a tendency to lash out at others. For that purpose it is best used for short periods of time to slowly bring the realization of release into your conscious acceptance. Ruby brings us to a joyful commitment for all social tasks. It wakes us and brings awareness to our thoughts and actions, and allows us to be courageous, impulsive and spontaneous. Ruby stimulates adrenal glands, the spleen and our circulation. It assists with infectious diseases like intestinal infection and can encourage fever in its function as resistance. Ruby has a special affinity with those born in July and the signs of Leo, Scorpio, Cancer and Sagittarius, but is beneficial to all signs. It's Energy is Projective, its Planet is Mars and its Element is Fire. In Burma, Rubies were valued for invulnerability. In order to reach that end, a Ruby had to be inserted into the flesh to become part of the body. For those who embedded them, they became invincible to any wounds caused by spears, swords or guns. Hindus valued Rubies above other stones as they were reported to preserve the body and mental health of the wearer by removing evil thoughts, controlling amorous desires and reconciling disputes. Many also believed that possessing one would also attract other gems to them because of its wealth-attracting qualities.